New compounds for the treatment of human African trypanosomiasis (HAT) are urgently required. Trypanosoma brucei (T.b.) gambiense is the leading cause of HAT, yet T.b. gambiense is often not the prime target organism in drug discovery. This may be attributed to the difficulties in handling this subspecies and the lack of an efficient viability assay to monitor drug efficacy. In this study, a T.b. gambiense strain, recently isolated in the D.R. Congo, was made bioluminescent by transfection with Renilla luciferase (RLuc) without altering its in vitro and in vivo growth characteristics. A luminescent multiplex viability assay (LMVA), based on measurement of the Renilla luciferase activity and the ATP content of the cells within the same experiment, was investigated as an alternative to the standard fluorimetric resazurin viability assay for drug sensitivity testing of T.b. gambiense. In a 96-well format, the RLuc transfected strain showed a detection limit of 2 × 104 cells ml-1 for the Renilla luciferase measurement and 5 × 103 cells ml-1 for the ATP measurement. 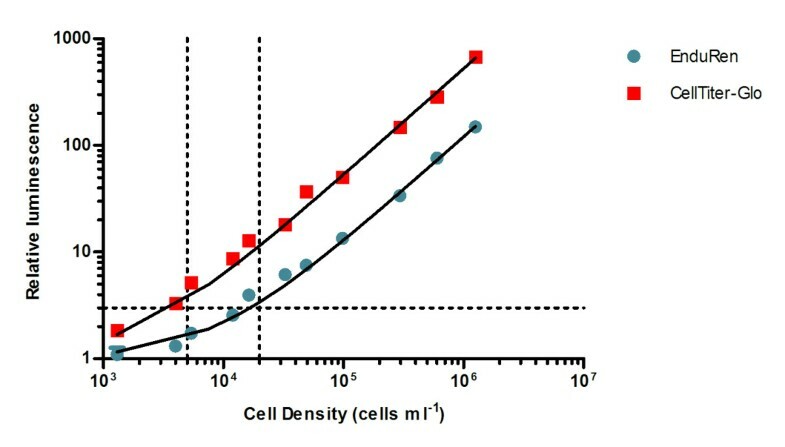 Both assays of the LMVA showed linearity up to 106 cells ml-1 and correlated well with the cell density during exponential growth of the long slender bloodstream forms. The LMVA was compared to the fluorimetric resazurin viability assay for drug sensitivity testing of pentamidine, eflornithine, nifurtimox and melarsoprol with both the wild type and the RLuc transfected population. For each drug, the IC50 value of the RLuc population was similar to that of the wild type when determined with either the fluorimetric resazurin method or the LMVA. For eflornithine, nifurtimox and melarsoprol we found no difference between the IC50 values in both viability assays. In contrast, the IC50 value of pentamidine was higher when determined with the fluorimetric resazurin method than in both assays of the LMVA. LMVA has some advantages for viability measurement of T.b. gambiense: it requires less incubation time for viability detection than the fluorimetric resazurin assay and in LMVA, two sensitive and independent viability assays are performed in the same experiment. Human African trypanosomiasis (HAT), or sleeping sickness, is caused by two subspecies of Trypanosoma brucei (T.b.) and is transmitted through tsetse flies (Glossina spp). T.b. rhodesiense causes an acute form of sleeping sickness in East Africa. T.b. gambiense is responsible for the chronic form in West and Central Africa and accounts for more than 95% of the near 10,000 sleeping sickness patients that are diagnosed and treated annually . In both forms, the disease evolves from a first stage with peripheral tissue invasion, towards a second stage with invasion of the central nervous system. The drugs for treating sleeping sickness are subspecies specific due to their different metabolisation, and are disease stage specific depending on their ability to cross the blood–brain-barrier . T.b. gambiense HAT is treated with pentamidine (first stage) and nifurtimox-eflornithine combination therapy or melarsoprol (second stage). T.b. rhodesiense HAT is treated with suramin (first stage) or melarsoprol (second stage). All these drugs are toxic and require intramuscular or intravenous injection except for nifurtimox which is an oral drug . Research into new drugs for HAT aims at drugs that are safe, that are active against both subspecies and both disease stages, that can be given orally and that need only one administration . Whole cell in vitro high-throughput screenings (HTS) are now in use to discover novel trypanotoxic compounds. However, these HTS assays are almost exclusively performed with one particular non human pathogenic strain: T. b. brucei strain 427[5–14]. Less often a hit is confirmed in vitro and in vivo on a collection of Trypanozoon strains, including T.b. rhodesiense and T.b. gambiense[15–20]. To be relevant for the current situation in the field, T.b. rhodesiense and T.b. gambiense strains that are recently isolated from patients with known treatment outcomes and that underwent few in vivo and in vitro passages, should be included in these drug discovery validation panels [21–23]. It would be even better to include T.b. gambiense strains already in the initial HTS screening, because, despite the high sequence similarity between the genomes of T.b. brucei and T.b. gambiense, the latter is often found to be more susceptible to drugs than other T. brucei subspecies, as is the case for eflornithine and pentamidine [15, 16, 25–27]. Several factors hamper inclusion of T.b. gambiense as a primary target organism in HTS. T.b. gambiense is particularly difficult to isolate from patients and to adapt to mice and to in vitro culture [23, 28]. Often, T.b. gambiense leads to silent or chronic infections in mice with hardly detectable parasites . Generally, bloodstream form parasites from in vivo or in vitro cultures are exposed to compounds for up to 72 hours, whereafter the remaining viability of the cells is assessed using either radioactive, colorimetric, fluorimetric, or luminescent detection [5, 9, 26, 30, 31]. The fluorimetric resazurin viability assay is very cost-effective, but performance is limited with T.b. gambiense strains due to lengthy incubation times with resazurin before detection of resorufin yields high enough signal to background for detection. 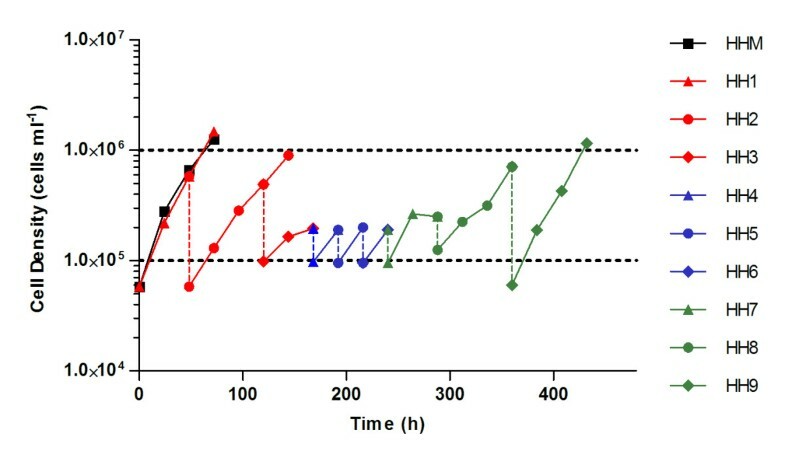 The reason for low conversion of resazurin to resorufin is unknown, but long term incubation times with resazurin with live or lysed trypanosomes may affect the IC50 value of a drug [26, 31, 32]. Because of their easy, sensitive and fast readout, viability assays based on ATP detection (such as the luminescent CellTiter-Glo assay) have been proposed and used as an alternative viability assay for HTS in T.b. brucei strain 427 [5, 7]. Currently, there is no reporter gene based in vitro assay employed for HTS compound screening, either for T.b. gambiense or for T.b. brucei and T.b. rhodesiense, unlike for other protozoan parasites such as Plasmodium falciparum, Leishmania spp. and Trypanosoma cruzi[33–39]. Renilla luciferase tagged parasites have previously been generated for T.b. brucei and T.b. gambiense and have proved effective for in vivo parasite tracking in murine models of experimental trypanosomiasis [29, 40] and for preclinical in vivo drug efficacy testing . Yet up to now, no in vitro application of Renilla luciferase parasites has been described. 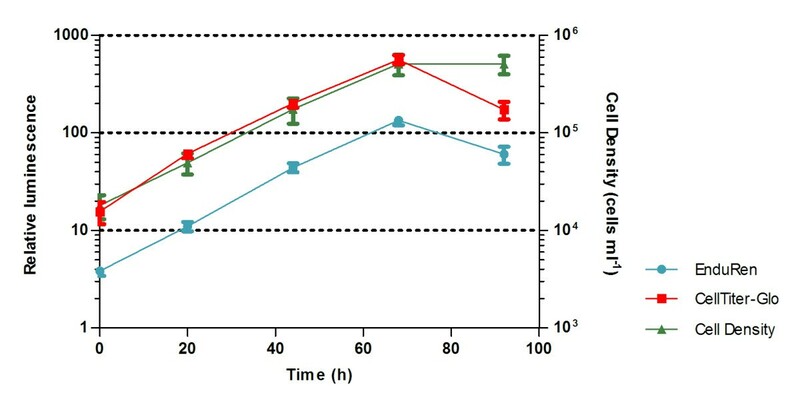 Recently, it has been shown that the EnduRen assay, for measurement of vital in vitro Renilla luciferase activity, can be combined with the CellTiter-Glo assay as an efficient luminescent multiplex viability assay for HTS compound screening against Dengue . Assays that measure multiple fitness parameters within the same wells, such as multiplex assays, may decrease false-positive rates and increase confidence for hit selection in HTS . In the present study, a T.b. gambiense strain that was recently isolated in the Democratic Republic of the Congo was made bioluminescent by expression of Renilla luciferase. With this strain, the feasibility of the Enduren/CellTiter-Glo luminescent multiplex viability assay, abbreviated as LMVA, was compared to the fluorimetric resazurin assay for drug sensitivity testing of the main drugs to treat T.b. gambiense sleeping sickness: pentamidine, eflornithine nifurtimox and melarsoprol. Iscove’s modified Dulbecco’s medium powder (IMDM) and fetal calf serum (FCS; heat-inactivated; EU approved South American origin) were purchased from Invitrogen. Methylcellulose (5140 mPa.s) was purchased from Fluka. All other culture media ingredients were from Sigma–Aldrich. An HMI-9 based stock solution  was adapted to prepare two culture media for use with in vitro culture of bloodstream form T.b. gambiense. Briefly, HMI-human serum (HH) contains HMI-9 with 15% v/v FCS and 5% v/v heat-inactivated human serum. HMI – human serum – methylcellulose (HHM) is HH containing a final concentration of 1.1% w/v methylcellulose. For fluorescent and luminescent activity assays, HH was prepared from IMDM without phenol red (Invitrogen). T. b. gambiense strain MHOM/CD/INRB/2006/23A, alias 348 BT, was isolated in Mbuyi-Mayi in the Democratic Republic of the Congo in 2006, from the blood of a second stage patient who was cured after a 10 day melarsoprol treatment . The isolation of the bloodstream form in vivo in rodents and the adaptation in vitro to HHM and the confirmation of its gambiense type I genotype have been described previously [23, 28]. An HHM adapted population of 348 BT, was inoculated in 500 μl of HHM in a 48-well plate at densities between 103 – 105 cells ml-1 and maintained in logarithmic phase growth by sub passages at appropriate dilutions after 24 to 72 hours of incubation at 37°C and 5% CO2. Cultures were monitored by phase contrast inverted microscopy. For cell counting, 20 μl were withdrawn and dispensed in a disposable Uriglass counting chamber (Menarini). Cultures were stepwise scaled up to 40 ml, by addition of four volumes of fresh medium in 25 cm2 flasks once the parasites reached a density of 5 × 105 cells ml-1. For long term storage, cells were cryostabilised in liquid nitrogen as tenfold concentrated log phase cultures in 90% HH with 10% glycerol. All animal experiments were approved by the Animal Ethics Committee of the Institute of Tropical Medicine Antwerp, under licence PAR019. Female OF-1 mice (40 – 50 g) (Charles River, Belgium), either immune suppressed with 200 mg kg-1 cyclophosphamide (Endoxan, Baxter) 48 h before infection or not, were infected intraperitoneally with 2 × 105 parasites in 200 μl, obtained from rodent blood or in vitro culture, and diluted at least 1:1 in phosphate buffered saline + 1% glucose pH 8.0 (PSG) . The matching method was used to monitor parasitemia in tail-blood  for 4 weeks after which the animals were sacrificed. The pHD309 RLuc expression vector, containing RLuc cDNA from pGL4 vector (Promega) was used for transfection . Parasites from flask cultures were harvested at 5 × 105 cells ml-1 and washed twice in cytomix (2 mM EGTA, 120 mM KCl, 0.15 mM CaCl2, 10 mM potassium phosphate pH 7.6, 25 mM Hepes, 1 mM hypoxanthine, 5 mM MgCl2, 5 g l-1 glucose, 100 mg l-1 BSA). Next, they were concentrated to 5 × 107 cells ml-1 and 400 μl of this suspension was transferred into a 4 mm cuvette (BioRad), whereafter 50 μl containing 10 μg of Not I (New England Biolabs) linearised pHD309 RLuc DNA was added. Subsequently, this mixture was pulsed once in a Gene Pulse Xcell electroporator (BioRad; 1250 V, 25 Ω, 50 μF), transferred to 12 ml of HH, plated in a 48-well plate in 250 μl volumes and incubated at 37°C for 24 h. Next, 250 μl of HH containing 2 μg ml-1 hygromycin was added. Populations were maintained in 1 μg ml-1 hygromycin for four weeks before cryostabilisation. The Renilla luciferase assay system (RLAS, Promega) was used to measure the RLuc activity from lysed cells. Forty μl of trypanosome suspension was mixed with 10 μl of 5 x Renilla lysis buffer and 20 μl of this solution was mixed with 100 μl of RLAS assay reagent (via dispenser) in a white opaque 96-well plate (Perkin Elmer). Each time an aliquot was dispensed into a well, the plate was shaken for 2 seconds and after a further 2 seconds delay, the number of photons per second (CPS) was measured for 10 seconds with a VictorX3 multimodal plate reader (Perkin Elmer). The luminescent multiplex viability assay (LMVA) measures first the RLuc activity in live cells with EnduRen (Promega) and next measures the cell ATP content with the luminescent CellTiter-Glo reagent (Promega) within the same assay wells. Luminescence in CPS was measured with a VictorX3 multimodal plate reader (Perkin Elmer). The EnduRen reagent was used according to the manufacturer’s instructions (Promega). Forty-five μl of trypanosome suspension was transferred to a half area white opaque 96 well plate (Perkin Elmer) to which 5 μl of 60 μM EnduRen in HH (or 5 μl of HH) was added. After 2 hours incubation at 37° C and a 10 minutes equilibration at 25°C, the luminescence was measured by integrating the number of photons per 1 second. Then, an equal volume (50 μl) of reconstituted CellTiter-Glo reagent (Promega) was added to this parasite suspension, after 2 minutes of shaking, and a 10 minutes delay, the number of photons per second was integrated. To assess the lower detection limit of wild type and recombinant trypanosome cells in HH, log phase trypanosomes at 105 cells ml-1 were harvested, concentrated and a tenfold dilution series was made in triplicate from 106 down to 102 cells ml-1 in 100 μl. This series was tested with the LMVA (using a 45 μl trypanosome suspension, as described above) and the RLAS (using 40 μl, as described above). The luminescent values (in CPS) of the cell containing samples were divided by the value of the blanks without cells (signal to background) and this relative luminescence value was plotted against the number of trypanosomes for each assay. Linear fits were used to find the lower detection limit of the number of trypanosome cells in each assay (at a signal to background ratio of 3 to 1). To measure the performance of the LMVA during the whole growth period, a trypanosome suspension of 2 × 104 cells ml-1 in 100 μl was inoculated in 15 wells and every day, for four days, triplicate wells were sampled for cell counting (using 20 μl cell suspension, as described above) and for the LMVA (using 45 μl cell suspension, as described above). Doubling times were calculated using non-linear regression in Prism (Graphpad). Eflornithine (Sanofi Aventis) and hygromycin B (Sigma) were prepared as 10 mg ml-1 stock solutions in distilled water. Melarsoprol (Arsobal, Sanofi Aventis), pentamidine isethionate (Sanofi Aventis) and nifurtimox (Sigma) were stored as 10 mg ml-1 stock solutions in DMSO. A method to measure the IC50 values of compounds in 96-well plates was performed as described elsewhere . Threefold drug dilutions in triplicate were made in HH from 100 to 0.14 μg ml-1 for eflornithine and hygromycin, from 50 to 0.07 μg ml-1 for nifurtimox and from 500 to 0.7 ng ml-1 for pentamidine and melarsoprol. Each drug concentration was inoculated with either 2 × 104 cells ml-1 or 5 × 103 cells ml-1 in a final volume of 100 μl. Next the plate was incubated for 72 hours. For detection of hygromycin sensitivity in the fluorimetric resazurin assay, 10 μl of 12 mg resazurin in 100 ml PBS were added to 100 μl trypanosome suspension in a 96 well transparent plate (Nunc). Alternatively, for comparison of IC50 values between the LMVA and resazurin assay, the 100 μl trypanosome suspension was split: 45 μl were used for LMVA as described above and 45 μl were transferred to a half area black opaque plate (Perkin Elmer) containing 5 μl of resazurin. After 24 h at 37°C, fluorescence was measured (excitation λ = 560 nm; emission λ = 590 nm) with a VictorX3 multimodal plate reader using top reading (Perkin Elmer) . The results were expressed as the percent reduction in parasite viability compared to parasite viability in control wells without drugs, and a 50% inhibitory concentration (IC50) was calculated using non-linear regression in Prism (GraphPad). To be compatible with compound screening, it was necessary to adapt the T.b. gambiense 348BT strain that readily grows in HHM to a medium without methylcellulose because the latter is very viscous, which renders homogenous volume distribution and centrifugation very difficult. The strain was adapted to HH medium by gradually diluting out the initial 1.1% (w/v) methylcellulose concentration in the HHM. With each daily subpassage, 1 to 5 volumes of the trypanosome suspension was inoculated in 9 to 5 volumes of HH, making sure that the starting cell concentration was between 5 × 104 and 1 × 105 cells ml-1. In many instances this approach was not successful and most subpassages resulted in cell culture cessation. One population survived eight subpassages in HH, whereafter its growth profile became similar to the original profile in HHM. When inoculated at ± 105 cells ml-1, the logarithmic growth phase lasted 72 hours with a maximum population density of ± 106 cells ml-1. This population was considered fully adapted to HH and used as such in further experiments. Figure 1 shows the growth profiles of the HHM adapted line, and from nine subpassages (HH1 – HH9) that resulted in this HH adapted line. Growth profiles of an HHM line, and from the nine subpassages (HH1 – HH9) that resulted in the HH adapted line of T.b. gambiense 348 BT. Vertical dotted lines mark the start of each new subpassage made using 90 to 50% new medium. We transfected the HH adapted line of T.b. gambiense 348 BT with plasmid pHD309 RLuc and obtained 3 recombinant populations from 2 independent transfections: population #2.1, #3.1 and #3.2. Hygromycin resistant populations were evident after 8 days of selection. After 4 weeks in 1 μg ml-1 hygromycin, the IC50 value for hygromycin, starting with a cell density of 2 × 104 cells ml-1, was calculated using the fluorimetric resazurin assay for wild type and recombinant populations. All recombinant populations were at least twenty times more resistant to hygromycin than the wild type population (Table 1). a reported in μg ml-1 ± SD, from 3 cultures and determined with fluorimetric assay for measurement of reduction of resazurin. b reported in number of cells ± SD, from 3 cultures and determined with RLAS, a luminescent assay for detection of Renilla luciferase activity in lysed cells. c reported in number of cells ± SD, from 3 cultures and determined with EnduRen, a luminescent assay for detection of Renilla luciferase activity in living cells. d reported in number of cells ± SD, from 3 cultures and determined with CellTiter-Glo, a luminescent assay for quantification of ATP. To select the most luminescent population, activity of the expressed luciferase in the wild type and recombinant populations was quantified with two assays that measure RLuc activity either in lysed cells (RLAS, Promega) or in live cells (EnduRen, Promega). With both RLuc activity assays, a linear fit between the number of log phase recombinant trypanosomes and relative luminescence (signal to background) data was obtained until up to 106 cells ml-1, the most dense trypanosome suspension tested. The lower detection limit generated from these linear fits was different for each of the recombinant populations and was also different between both RLuc assays (ANOVA, p < 0.05) (Table 1). Due to its lowest detection limit in both RLuc assays, population #2.1 was identified as the most luminescent population. The CellTiter-Glo assay was used to measure the luminescence of the ATP content of wild type and recombinant populations. A linear fit between the number of trypanosomes and relative luminescence signal could be found up to 106 cells ml-1, the most dense trypanosome suspension tested. The lower detection limits generated from these linear fits were equal for wild type and each recombinant population (ANOVA, p > 0.05) (Table 1). Importantly, the detection limit in the CellTiter-Glo assay was not altered, whether or not the EnduRen substrate was included in the medium (ANOVA, p > 0.05). This allows the EnduRen assay to be combined with the CellTiter-Glo assay in one multiplexed luminescent format, i.e. the LMVA, reporting thus both on the signal from the RLuc expression as well as on the signal of the ATP viability assay from the same wells. Figure 2 shows that for the most luminescent population, RLuc #2.1, we require at least ± 2 × 104 cells ml-1 to obtain a signal to background ratio of at least 3 to 1 for the EnduRen assay, while the CellTiter-Glo assay requires only ± 5 × 103 cells ml-1. Relative luminescence of LMVA in function of cell density tested with population RLuc # 2.1. Horizontal dotted line represents a signal to background ratio of 3 to 1.Vertical dotted lines mark the cell density necessary for detection at this signal to background ratio (5 × 103 cells ml-1 for CellTiter-Glo and 2 × 104 cells ml-1 for EnduRen). The growth profiles of T.b. gambiense 348BT wild type and RLuc #2.1 were established by the LMVA and by daily cell counting during a 5 time-points experiment lasting 96 hours. Figure 3 shows that at a starting concentration of 2 × 104 cells ml-1, both arms of the LMVA could record the exponential growth of the RLuc population during the first 72 hours. After 96 hours, when the population was in stationary phase, the output of both luminescent assays was lower than expected from the cell density. Doubling times in the exponential growth phase calculated with LMVA data, using either EnduRen or CellTiter-Glo, did not differ significantly from the doubling time calculated with the cell counting data nor did these growth rates differ between wild type and RLuc #2.1 (ANOVA, p > 0.05) (Table 2). Growth curve of RLuc# 2.1 in function of time, assessed by LMVA (in relative luminescence, left Y-axis) and by microscopy (cell density, right Y-axis). a reported in h-1 ± SD, from 3 cultures. b luminescent assay for measurement of Renilla luciferase activity in living cells. c luminescent assay for quantification of ATP. The IC50 values for pentamidine, eflornithine, melarsoprol and nifurtimox were compared between the wild type and the RLuc #2.1 populations, between one or both arms of the LMVA and the fluorimetric resazurin viability assay and between using 2 × 104 or 5 × 103 cells ml-1 as starting concentration (Table 3). We could not observe a significant difference in IC50 values between the wild type and the RLuc population for any given viability assay (ANOVA, p > 0.05) or starting concentration (ANOVA, p > 0.05) when using the same drug. Furthermore, for eflornithine, melarsoprol and nifurtimox, there was no variation in IC50 values obtained from the different viability assays (ANOVA, p > 0.05) when using the same starting concentration. However, for these drugs, all viability assays recorded significant differences in IC50 values between using 2 × 104 or 5 × 103 cells ml-1 as a starting concentration (ANOVA, p < 0.05). In contrast, for pentamidine, we observed higher IC50 values in the resazurin assay than in either the EnduRen or CellTiter-Glo assay (ANOVA, p < 0.05) when using the same starting concentration. However, the differences in IC50 values between using 2 × 104 and 5 × 103 cells ml-1 as a starting concentration were not significant for this drug (ANOVA, p > 0.05). We conclude that the presence of pHD 309 RLuc does not influence the susceptibility of T.b. gambiense 348 BT to any of the tested drugs, but a particular drug may influence the IC50 value when tested with a different viability assay (as for pentamidine), or when a different starting concentration is used (for eflornithine, nifurtimox and melarsoprol). a values are the mean ± SD from 4 cultures. b reported in μg ml-1. c reported in ng ml-1. d luminescent assay for measurement of Renilla luciferase activity in living cells. e luminescent assay for quantification of ATP. f fluorimetric assay for measurement of reduction of resazurin. Differences in infectivity, as determined by the number of days until the first parasite is detected (prepatent period), and virulence, as determined by the number of days of survival of the rodents, between the original cell line (adapted in vivo but not in vitro), the HHM and HH (adapted in vitro) cell lines, and the resulting RLuc cell line, were compared by expanding each population in 4 mice treated or not with endoxan. All mice were found parasitemic after 3 to 7 days of infection. The mean prepatent period was not significantly different between mice treated or not with endoxan and between the different trypanosome cell lines (data not shown). During the next 3 weeks of follow up, we could sporadically detect waves of parasitemia in all mice of all groups. No mice died from the infection during the experiment and all mice were sacrificed at day 30. This study was undertaken to develop a Renilla luciferase based luminescent multiplex viability assay (LMVA) for in vitro compound screening on bloodstream form T.b. gambiense. To obtain the RLuc transfected T.b. gambiens e, we started with a recently isolated strain that underwent few in vivo passages in rodents and that was adapted to in vitro HMI-9 based medium with human serum (HH). Although nucleofection has been described to be very efficient for transient and for stable transfection of African trypanosomes [29, 49, 50], our study confirms that transfection with pHD309 RLuc is also successful by electroporation . Due to the presence of hygromycin phosphotransferase as resistance selection marker for stable genomic integration of Renilla luciferase, cross resistance against trypanotoxic hygromycin analogues may pose a problem, as has been described for pyrimethamine resistance of a transgenic firefly luciferase Plasmodium strain . To select the most RLuc transfected trypanosome population, two RLuc activity assays were used. The RLAS system is very sensitive, but is not compatible with CellTiter-Glo and requires more manipulations than the EnduRen assay. In the EnduRen assay, only the most hygromycin resistant population allowed fast detection of low numbers of cells (± 2 × 104 cells ml-1). In contrast to the EnduRen assay, the CellTiter-Glo assay does not require genetic manipulation of the trypanosome strain, the assay is performed faster and has a lower detection limit (± 5 × 103 cells ml-1). Combining the EnduRen assay with CellTiter-Glo as two independent assays measuring respectively the RLuc activity and the ATP content of the cells, we were able to establish a multiplex viability assay for which the luminescence signals correlate well with the cell density during the proliferation of the long slender bloodstream form trypanosomes. The multiplex luminescent format has several advantages over the fluorimetric resazurin assay: first, viability assessment requires less incubation time with substrate before detection takes place (2 hours vs 16 – 24 hours) and second, two independent viability parameters are assayed in the same experiment (RLuc activity and ATP content). Disadvantages of this LMVA are its higher cost compared to the resazurin assay and the need for an RLuc transfected trypanosome strain. On the other hand, transfecting a trypanosome strain with a luminescence reporter gene makes it possible to first select trypanocidal compounds in vitro and subsequently test their activity in vivo with the same trypanosome strain by bioluminescence imaging of infected mice. Here we confirm that even after transfection with pHD 309 RLuc, the in vitro and in vivo growth characteristics of the recombinant T.b. gambiense strain are not different from the wild type strain. We used several drugs that are in use against T.b. gambiense sleeping sickness to investigate whether the pHD 309 RLuc integration would have altered the drug sensitivity profile compared to the wild type. No such influence could be observed. Furthermore, the IC50 values for these drugs fall within range of other T.b. gambiense field strains isolated in Mbuji-Mayi, Democratic Republic of the Congo, that have been used recently for validation of fexinidazole [20, 26]. Before the present LMVA can be adopted as HTS assay, further evaluation and optimisation is necessary. Also, the assay should be tested for its applicability on other RLuc transfected Trypanozoon strains that have become available recently, including T.b. brucei, T.b. rhodesiense and T. evansi strains. In conclusion, we showed that a luminescent multiplex viability assay with an RLuc transfected T.b. gambiense strain can be used as an alternative to the resazurin viability assay in drug discovery. Both the LMVA assay and the trypanosome strain represent valuable assets in the fight against sleeping sickness, complementing the available tools for HTS compound screening, particularly where it comes to confirm in vivo trypanocidal activity of molecules that have been selected in vitro. The pHD 309 vector was a kind gift of Dr George Cross. Authors like to thank Maarten Van Den Boogaerde, Jeroen Swiers en Nicolas Bebronne for technical assistance. This work was supported by the Fonds voor Wetenschappelijk onderzoek (FWO) [grant 1.5.147.09, G.0229.10 N]. The funding agency had no role in the collection, analysis, interpretation of data, writing of the manuscript and in the decision to submit the manuscript for publication. NVR carried out the adaptation of the strain in vitro, did the transfection and selection of the luminescent clones, performed the luminescent and fluorescent activity assays, did the statistical analysis and drafted the manuscript. PP isolated and adapted the strain in vivo. SR revised the manuscript. FC made the luminescent vector pHD309 RLuc and obtained funding for this manuscript and PB participated in the design of the study, obtained funding and did the critical revision of the manuscript. All authors read and approved the final version of the manuscript.